The BEST Broccoli Slaw recipe! This salad always gets rave reviews. It’s loaded with broccoli, almonds, sunflower seeds, ramen noodles, and green onions and tossed in the most flavorful dressing. 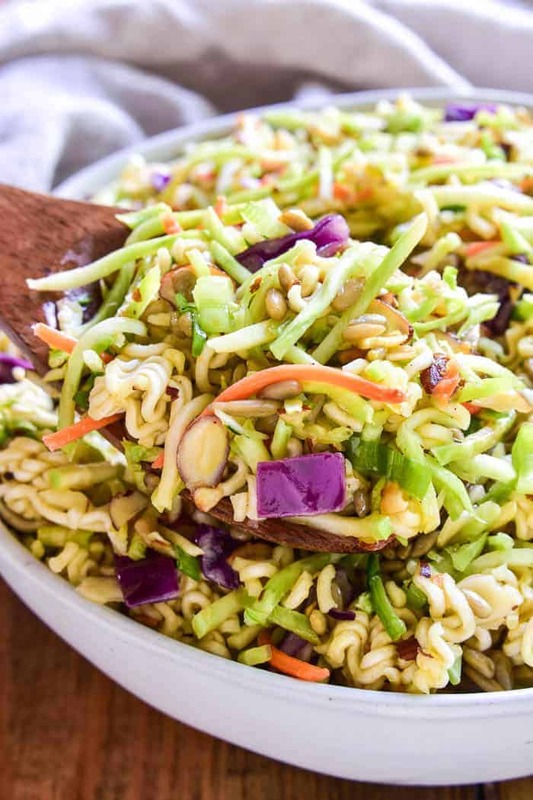 Perfect for end of summer picnics or year round get togethers, if you love cole slaw, you’ll love this delicious broccoli slaw twist! HOW DO YOU MAKE BROCCOLI SLAW? 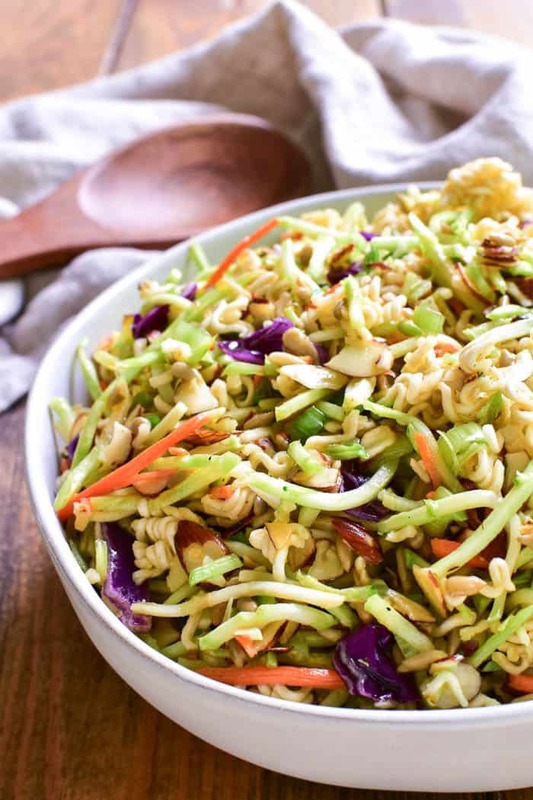 In a medium mixing bowl, combine 1 package of broccoli slaw mix, 1/2 c. toasted sunflower seeds, 2 oz. toasted slivered almonds, 2 packages broken ramen noodles, and 1/3 c. chopped green onions. In a small saucepan, combine 3/4 c. olive oil, 1/3 c. sugar, 1/4 c. rice wine vinegar, and 2 packages ramen soup seasoning. Heat dressing, stirring, until sugar dissolves. Cool. Pour dressing over salad and toss; refrigerate until ready to serve. 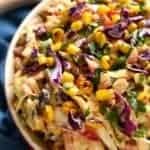 CAN I MAKE BROCCOLI SLAW MIX FROM SCRATCH? 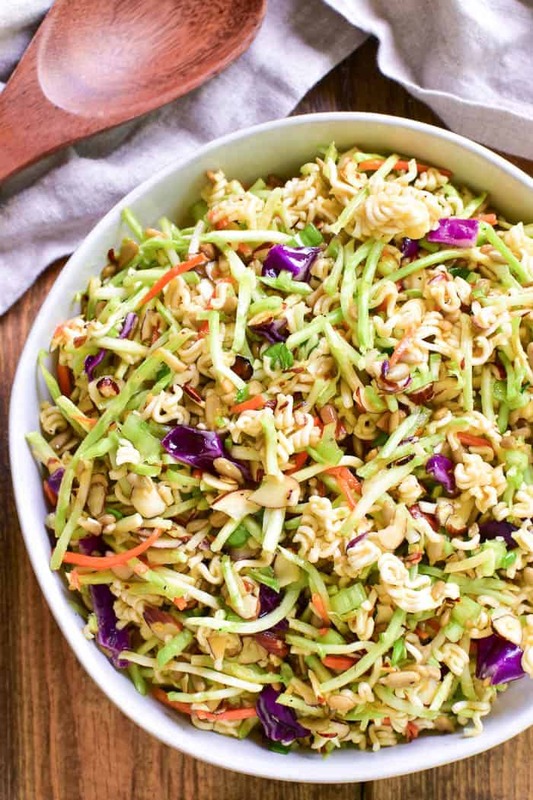 If you are unable to find broccoli slaw mix or prefer to make it from scratch, it’s easy to do! Just shred broccoli and peeled carrots using a box grater, then add some thinly sliced red cabbage. HOW DO YOU STORE BROCCOLI SLAW? Broccoli Slaw can be stored in an airtight container in the refrigerator for 3-5 days. So. It’s Labor Day weekend! Do you have any fun plans? I’m not gonna lie…I’m pretty excited that it’s finally here. Not just because Labor Day means a 3 day weekend, and fun with friends, and a little extra time to relax, but because Labor Day signals the start of the school year. WOOHOO!!! After spending the past 3 months at home with my kids, I’m ready. And you know what? I’m not even going to feel bad about it. Just like I’m not going to feel bad about doing nothing this weekend except relaxing and enjoying time with family and friends. And….of course….eating! Labor Day weekend is the perfect time to squeeze in one last summer party, and it’s the perfect time for grilling. And we all know that half the fun of grilling is making tons of fun sides to go with it! You better believe I’ll be making Tomato Cucumber Feta Salad and Caprese Corn Salad…and this Broccoli Slaw with ramen noodles would make a great addition to the menu. I don’t know about you, but I love a good Broccoli Salad recipe. 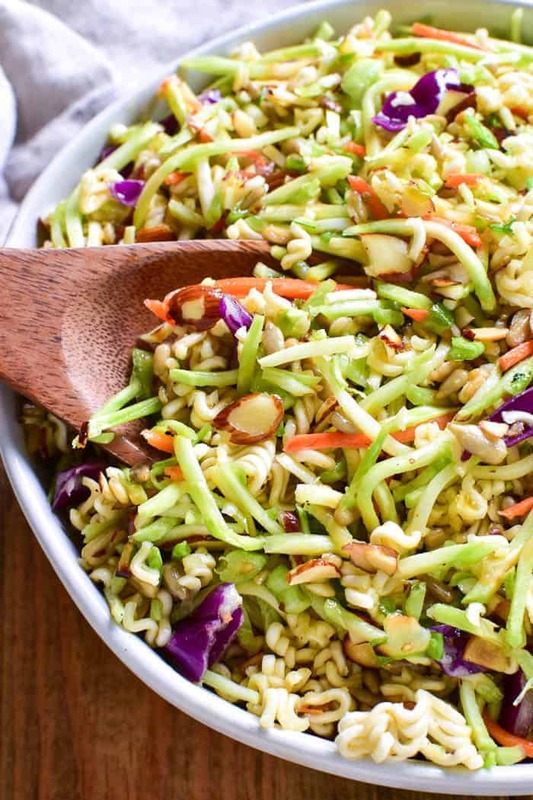 And this Broccoli Slaw is a great alternative for all you broccoli lovers out there. This easy slaw is the perfect blend of savory and sweet, and what I love most about it is the crunch. 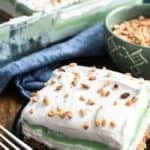 Between the broccoli and the almonds and the toasted sunflower seeds…this salad adds a delicious crunch factor to any meal. 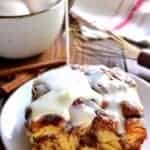 It comes together in minutes and can easily be made in advance. In fact, it tastes better when it is! And best of all, it travels and stores well, making this Broccoli Slaw the perfect salad for any occasion. 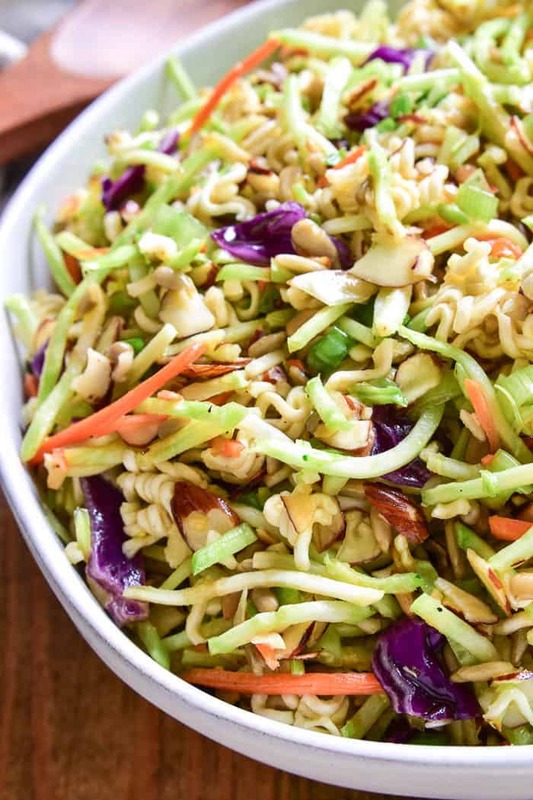 The BEST Broccoli Slaw recipe! This salad always gets rave reviews. It's loaded with broccoli, almonds, sunflower seeds, ramen noodles, and green onions and tossed in the most flavorful dressing. 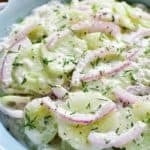 Perfect for end of summer picnics or year round get togethers, if you love cole slaw, you'll love this delicious twist! 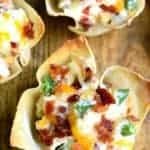 Combine salad ingredients in a large mixing bowl. In a small saucepan, combine dressing ingredients. Heat, stirring, over medium-high heat until sugar dissolves. Let dressing cool; pour it over salad and toss to combine. Omg…all my favorites together! Can’t wait to put this on the table at a family gathering! 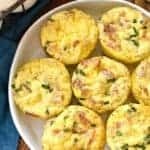 That looks to be very yummy and tasty recipe which I have seen from recent time , will surely try this and surprise family with my new cooking talent. I love that this has the crunch that coleslaw is missing. 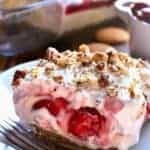 It’s so good and always gone after a get together. This looks so amazing I cannot wait to try it out !! 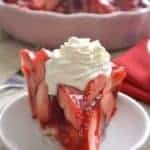 Looks so festive and absolutely delicious! I bet those flavors on it are amazing, love it! I’ve never tried broccoli slaw. But this salad looks healthy and flavorful! This is addicting! I love the flavors and textures. This has just the right amount of crunch. I sure sounds delicious. One of my favorites! 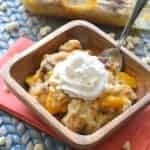 Always make this during the Summer for potlucks! I’ve never liked broccoli. But this looks healthy and tasty, at least when I see it. 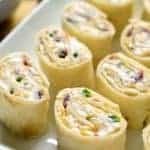 Even I love cooking and have some tips for Indian foods. but I am working at greetstore as a designer executive. Overall I loved your stuff. keep working. This doesn’t have a strong broccoli flavor. Hope you give it a try!